This is where the 'heretic' pharaoh wanted to spend eternity. His son, however, had other plans. Towards the end of his life, Akhenaten's life was filled with great tragedy. His two great loves, Nefertiti and Kiya, had died, along with his mother Tiye, and at least four of his six daughters. Deep down, he may have also suspected that his bold new religion wouldn't survive him as well. Akhenaten had revolutionised the age-old Egyptian religion. Gone were the dark temples filled with incense and statues of animal-headed gods. Instead, his was a religion of light. Akhenaten founded a new city at Amarna in Middle Egypt, dedicated to the worship of the Aten, the power and light of the sun, represented by a disc with rays ending in hands. The temples there were open to the sky and the life-giving warmth of the sun. The city was encircled with 14 boundary stelae detailing his vision for the city - including a decree that when he died, he would be brought back to Amarna to spend eternity. The tomb faced east, ready to greet the rising Aten each morning. It had been thoroughly plundered by the time archaeologists explored it. Inside they found fragments of his sarcophagus, his canopic chest and over 200 shabti figures to act as his servants in the afterlife. The king's golden coffins were naturally missing, as well as his body. The inscriptions on the walls, depicting the royal family adoring the Aten, had been violently attacked, erasing the king's heresy ever more. The king was probably buried there according to his wishes. For a while. Only a few years after Akhenaten's death, his son, Tutankhamun, would drive the counter-revolution to restore Egypt's traditional gods and temple institutions to their rightful places. Amarna was abandoned and the tomb of Tutankhamun's father opened up. With no royal presence there, the king's burial was threatened by tomb robbers, so Akhenaten's body was brought to the royal burial ground in the Valley of the Kings. There the king was discovered amongst an assortment of burial goods from the Amarna tombs, in KV55. Why did Akhenaten do it? What drove him to turn thousands of years of traditional worship upside down? 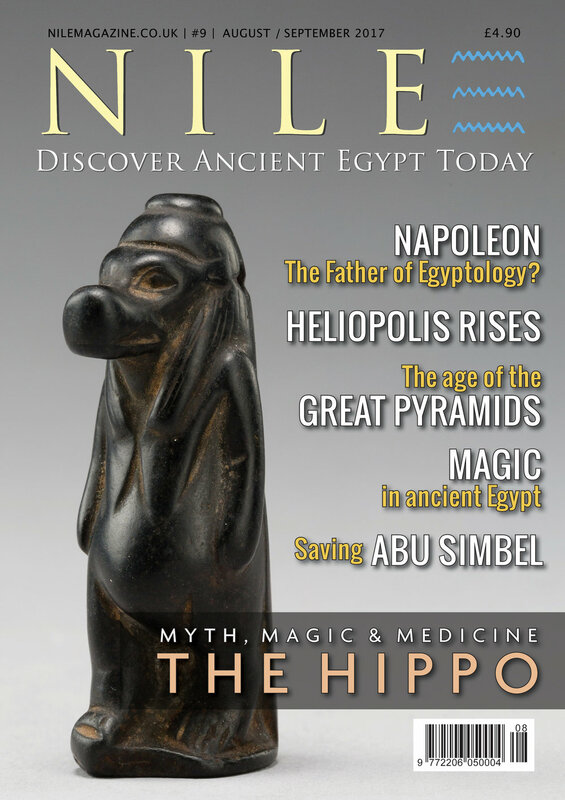 Read the answer in the latest NILE Magazine. Visit the 'NILE Store' page to download yours today. Pictured is the burial chamber of Akhenaten's tomb at Amarna. The plinth was to support the granite sarcophagus which is now on the grounds of the Egyptian Museum in Cairo.